Can you legally get married in France? One can only legally marry in France through a civil ceremony held at the council offices, or à la mairie. This can then be followed by a religious or secular ceremony, or whatever kind of celebration the couple desires. Such a ceremony can weave in aspects of the couple’s native culture; many Indian-style weddings, for instance, have long been hosted at traditional French chateau venues such as Château Bouffémont, and lend themselves to especially beautiful photography. As explained by Expatica, there is a certain process that must be followed for those wishing to visit France to get married – having a parent living in the country is an undoubted advantage for securing the special dispensation required to officially tie the knot in the country. Alternatively, couples may elect to hold the civil ceremony in their country of residence or origin first, before holding a second, religious or secular, ceremony in France. Separate from the subject of formally tying the knot in France is that of imbuing your wedding ceremony with a suitably French style – and there can be few better ways of accomplishing that than the selection of the most quintessentially French private venue for your nuptials. Nor could there be a much more quintessentially French place to marry than a resplendent chateau property such as Château Bouffémont. This 19th-century residence represents a truly luxurious, fairytale venue, set in large grounds consisting of spectacular manicured French gardens that continually enchant couples and guests. Inside the exclusive and desirable property, meanwhile, can be found highly refined furnishings and crystal chandeliers in functional rooms that constitute exceptional settings for receptions. Everywhere one looks in and around Château Bouffémont, one sees all of the trappings of an extraordinarily romantic French wedding venue in peaceful surroundings. Whatever you expect from your choice of French wedding venue – ranging from the height of aristocratic charm and fine interior fabrics to refined cuisine for your guests and a tailor-made service – you can expect it at Château Bouffémont. However, there is much more to consider when you are contemplating your dream of formalising your union in this most romantic, gorgeous and culturally captivating country. 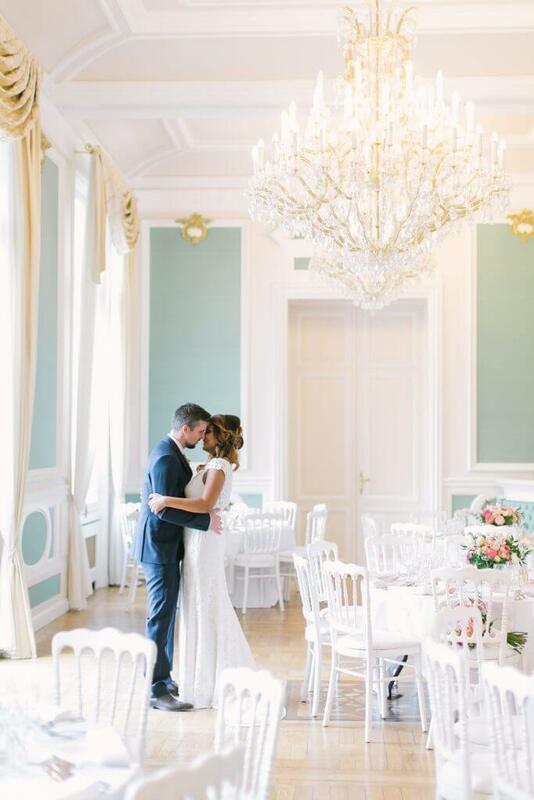 Click through to learn more from Wedding Ideas magazine about how you can base your wedding around a romantic Parisian theme, in recognition that here at Château Bouffémont, we are situated a mere 30 kilometres from the centre of the unspeakably beautiful City of Lights. Alternatively, you may be interested in reading more of our own advice on planning your dream wedding at a French chateau property.